In support of the Wilson-Miller Legacy Fund to strengthen access to programs and services for people with disabilities. 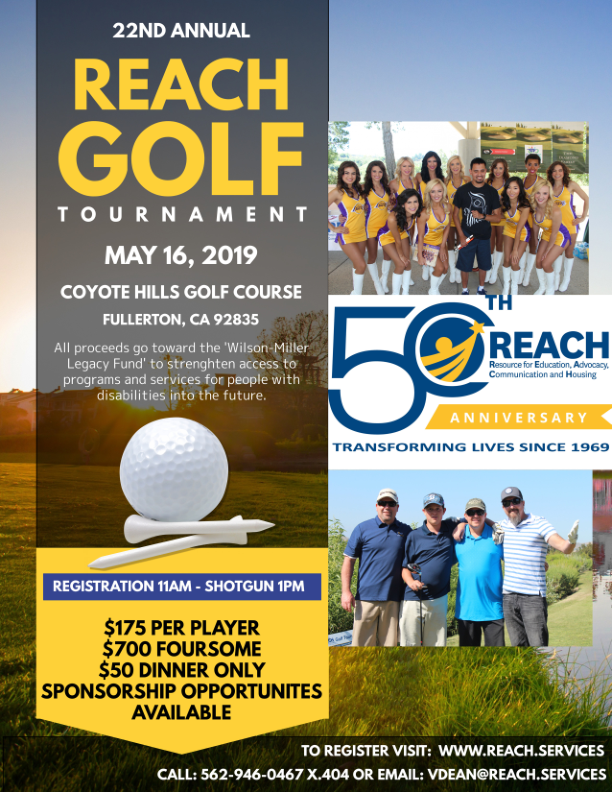 We are excited to announce the 22nd Annual REACH Golf Tournament will be taking place on Thursday, May 16, 2019, at the Coyote Hills Golf Course in Fullerton. As the biggest fundraising event of the year for our organization, the Golf Tournament fuels our mission of transforming the lives of individuals with diverse abilities by helping them discover their voice and realize their dreams. The tournament brings together many friends, community partners, organizations, dinner guests, and volunteers. Beyond the competition, everyone enjoys music, refreshments, a delicious dinner, and raffle drawings. Golfer or no golfer, it’s a great way to spend a day helping others!